A September court ruling strips Dominican citizenship from children of undocumented immigrants – mostly Haitian – even if they were born in the DR, Ezra Fieser reports for The Christian Science Monitor. Haitian and Dominican officials emerged from talks Tuesday with a broad-stroke agreement on how a controversial Dominican court ruling on citizenship would be carried out, marking the first sign of progress on an issue that has been central to a deteriorating relationship between the countries. In a joint statement, the delegations said the Dominican government assured Haiti that “concrete measures will be taken to safeguard the basic rights of people of Haitian descent” living in the country. The meeting came in response to a September ruling by the high Dominican court that strips citizenship from children of undocumented immigrants, even if they were born in the country and were previously registered. The government, after reviewing birth records going back to 1929, said some 24,000 people will be affected, although human rights groups maintain the number is exponentially higher. The majority of people who could lose their citizenship in the Dominican Republic are of Haitian descent. Fallout from the ruling, as well as disputes over migration and trade issues, has further harmed a historically rocky relationship that reached new lows in recent months between the Caribbean neighbors sharing the island of Hispaniola. While the meeting was considered a success because it marked a fresh start for bilateral talks, the Dominican delegation did not change its position on the court ruling or how it would carry it out. Going into the meeting, the Dominican government said it would not negotiate the decision itself or how the government plans to implement it. Dominican officials yesterday said they will put forth legislation in coming weeks to provide a pathway for those impacted by the court ruling to regularize their status and eventually naturalize, according to a statement from the presidential palace. The countries seemed bound for better days following the 2010 earthquake that decimated the Haitian capital. Dominicans rushed into the country to help, including then Dominican President Leonel Fernandez, who was the first head of state to visit Haiti following the disaster. Yet, the relationship has crumbled since, with a pivotal moment coming in June when Haiti banned imports of Dominican chicken parts and eggs. 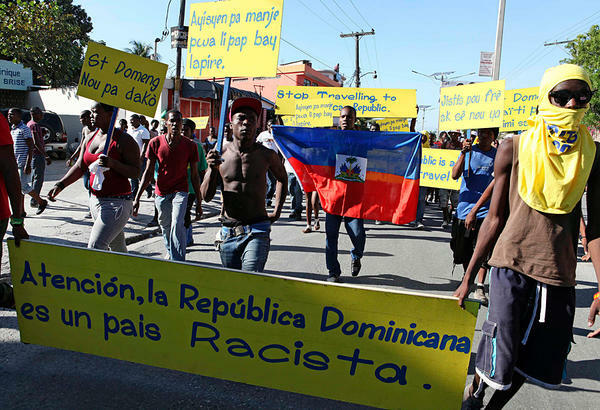 The situation deteriorated further in November when Dominican migration authorities deported hundreds of Haitians in response to the murder of an elderly couple, which local residents blamed on Haitians. Following the three-hour meeting in the northern Haitian border town of Ouanaminthe, Haiti said it recognized the Dominican Republic’s sovereignty on the thorny issue of migration. While separate policy issues, migration and birthright citizenship are linked because the ruling overwhelmingly affects the children of Haitian migrants, who crossed into the Dominican Republic to work in sugar-cane fields and, later, in construction. While it seemed to accept the court ruling on citizenship, the Haitian delegation pushed for better treatment of those migrant workers, as well as for the loosening of visa restrictions for Haitians studying in Dominican universities. While the Dominican Republic has long faced criticism for its treatment of Haitian migrants, the ruling has brought a fresh bought of shame both within the country and internationally, with rights groups denouncing it as a xenophobic attempt to further marginalize darker-skinned residents already struggling with poverty and social exclusion. The Caribbean Community (CARICOM), a regional economic organization to which the Domincian Republic has been trying to become a full member, said that the court decision was not in accordance with its norms. The Obama administration, Caribbean and Latin American governments, the European Union, the United Nations, and others have also raised issue with the ruling. The countries plan to meet again Feb. 3 in the Dominican Republic.